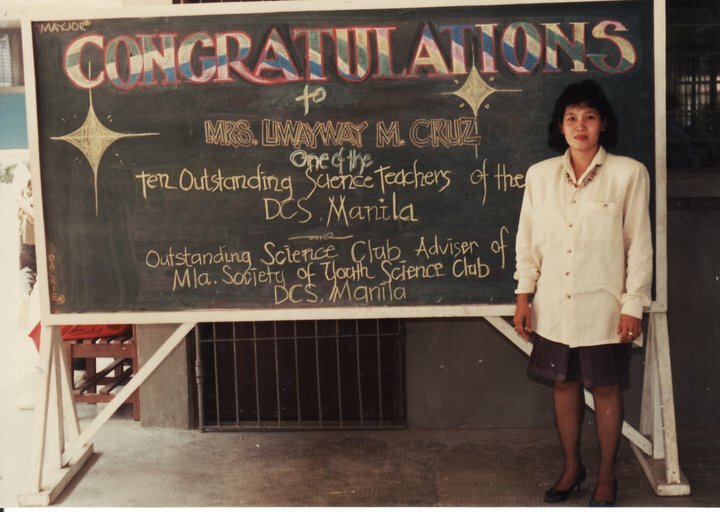 Liwayway M. Cruz was once awarded as "most outstanding high school science teacher" in Manila. Today, World Teachers Day, allow me to devote this space to something written by someone from among the hundreds of thousands of Filipino teachers. This someone was my first and certainly my best teacher. She’s my mother who’s now teaching at the Polytechnic University of the Philippines. She shares her views on being a teacher in this essay she posted today on her Facebook page. I started teaching both in the secondary and tertiary levels and after more than two – decade of teaching experiences I decided to be full time in the tertiary level. But my 19 years stay in high school , Tondo High School in particular were my most memorable, fruitful and even the happiest years in my entire teaching life. Teaching in college is entirely different from where I used to be, a demonstration teacher. My first few months in the university seemed too boring for me. It was just making use of blackboard and chalk or simply asking students to report. So after a semester, I decided to make experiments on the different teaching methods that would be applicable or appropriate in my field which is science and my objective was and still is, is to make my subject a venue for students and me too, to learn, to be trained, enjoy and look for the relevance of my subject to their own respective courses. Finally, after a series of trials and even disappointments, creating culture shocks in the university, I decided to utilize the seminar type of teaching and integrate environmental consciousness and reinforce values in my subjects. College students are offered with subjects that seemed to be boring and uninteresting to most of them. These are sciences that they have to enroll as electives. With the belief that teachers properly equipped with teaching methods and strategies reinforced by teaching aids and/or instructional materials can make a subject the most stimulating one, thus making students learn more effectively. In this light I have come up with books that I wrote and revised to give justice to the subjects I am handling and to make students enjoy more in reading and learning from them. My books in Ecology, Biological Science and Anatomy and Physiology offer opportunities for self- assessment of learning, through module-workshops, coloring activities, puzzles and self-progress tests and enable them to develop deeper appreciation of the human body and nature. More importantly, my books introduce a kinesthetic sense into the learning process as hand motion is integrated with visual stimuli. We alone make the important choices in our lives. Every choice counts. There is a need for us to be willing to take responsibility for everything that happens to us and all that we do. We ought to be ready to face everything and avoid nothing. We as teachers need to take the responsibility for creation. This is in terms of having a very big heart. A heart willing to teach, love and care for the students. We also need to resist saying I can’t do it or do that because it is all up to us. Our biggest fear is not that we are powerless. It is that we are powerful beyond measure, and each moment is calling on us to take risks and create. Teachers should be opened in utilizing innovations, and new strategies inside the classroom. As a teacher I am trying to break through the barriers of dependence on old thought patterns, thus giving me tremendous power connecting my students and me into the present: a new learning based on interdependence and on living and collaborating on a network planet. It is a learner-driven strategy, where they are taught to initiate and manage the learning process. My students are involved with the state-of-the-art, cutting-edge learning through multi-media learning mediums. I also involve my students in synergistic learning wherein they are encouraged to use their ability to see and work with their unique differences, using their strengths and weaknesses to complement each other. Students are taught to reinforce the values of teamwork, cooperation, collaboration, interdependence and concern for others to allow them to work in many different types of teams and be part of the global culture where we are now. Students are also allowed to be part of what we call making sense of life learning, where learning is relevant to their experiences and expectations. Students are also encouraged to participate in community involvement activities. I also consider learning to learn wherein my students are given the opportunities to know more about how they learn so that they can improve their capacity to learn and think. And there is no doubt that this quotation is leading me to where I ought to be, a teacher who loves her work, trying to make a difference: setting high standards for life, love, creativity and wisdom. Finding ways how to connect with your students are important and essentials to influence them. It’s good to observe and study their behavior to check what kind of approach to give. As a student I will remember teachers like you who have a heart of teach. I can say that if one of your student read this blog, sure you can get a good message. 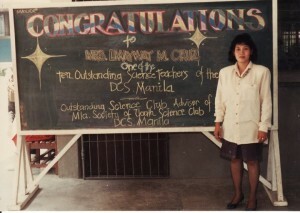 prof. cruz was my professor in PUP 13 yrs. ago. i still remember her voice . it’s “malumanay”. i became a member of a club which she moderated… i received a high grade from her… i want to apologize to her though for not attending one of the review classes she handled. she even assigned me to lead a group. unfortunately, i ditched her class. that was the last time i saw her.